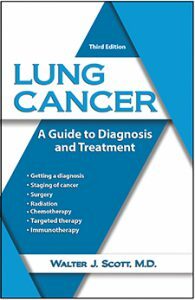 The third edition of Lung Cancer—From Diagnosis to Treatment rolls off the press this Fall. Among the updates, is information on newer forms of treatment, including targeted therapy and immunotherapy. The author, Walter Scott, M.D., is a thoracic surgeon. He is chief of the Division of Thoracic and Esophageal Surgery at Abington Jefferson Hospital and a member of the Sidney Kimmel Cancer Center of Thomas Jefferson University Hospital, in Philadelphia.